Since we’ve already posted one entry about the nomads of Mongolia, I though it would be interesting to delve a bit deepr in the various nomadic cultures in the world, and do a short series on other fascinating peoples who still follow a nomadic lifestyle. 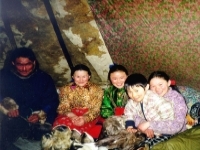 The Nenets people are probably not as well known as the nomads of Mongolia, but their culture is just as fascinating. What’s admirable about these people is that they have managed to carve themselves a home and build a rich and complex culture in one of the least hospitable places on earth. The Nenets people are native to the the Yamal Peninsula and its surrounding regions, cold expanses covered in permafrost. The Nenets have been living in the same way for generations, herding reindeer from the summer pastures in the north to the winter pastures in the south. They travel for hundreds of miles every year, and it’s difficult to decide whether the ones leading the way are the people or the deer. 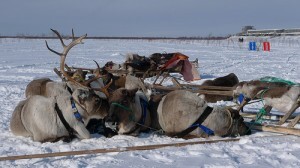 The Nenets hunt and herd their deer with only their own efforts, helped out only by the Samoyed dogs which they had been breeding long before the Europeans trained them for their polar expeditions. The religion o the Nenets people preaches a close communion with nature, and the respect of the land which helps them sustain themselves. Animals are very important in their faith, and the polar bear, for example, are revered creatures. 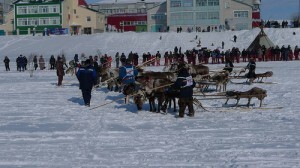 Their beliefs are animistic, and dolls representing the spirits of the elders are often carried around on specials sledges. But nature takes as much as it gives, and other tundra-dwellers like the wolves which prey on the reindeer can cause huge losses to the families which live off solely of herding. 80% of the deer are the private possession of the Nenets families, who make money by selling the meat. The rest of the deer are owned by the state, but the Nenets who herd them receive wages for their work (although these wages are pitifully small when compared to what they earn from selling the antlers to various Asian countries). The reindeer provide almost everything the Nenets need: food, shelter, clothing, transport and also wares they can sell to others. The traditional Nenets tent, the mya, has a conical shape and it is built using reindeer hides mounted on heavy poles. Their clothes are hand-sewn by the women, and they usually consist of pieces of reindeer skin sewn together with the fur in the inside, to protect them against the cold. Both the men and the women wear hip-high reindeer boots, not surprising seeing as temperatures can drop to -50 degrees Celsius in the winter.